Denny Hamlin finished 20th in Saturday night’s NASCAR Sprint Cup Series All-Star Race at Charlotte Motor Speedway after the handling of the #11 FedEx Office Toyota went away for the final 10-lap segment in the event won by Jimmie Johnson. Hamlin started third in the 90-lap exhibition, comprised of four 20-lap segments followed by a 10-lap dash to the checkered flag. The 31-year-old Virginia native, making his sixth All-Star start, led 16 laps on Saturday night, but an ill-handling machine late in the race dropped him in the running order. Johnson won his third All-Star Race, and was followed to the finish line by Brad Keselowski, Matt Kenseth, Kyle Busch and Dale Earnhardt Jr.
On Thursday, the FedEx Racing team finished second in the Sprint All-Star Pit Crew Challenge in Charlotte. The two-time defending #11 over-the-wall crew made it to the final round for the third-straight year, but were edged out in the championship round by the #48 team. 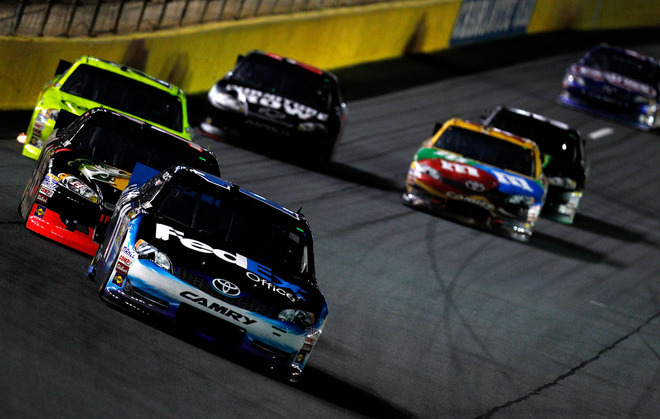 NASCAR returns to Charlotte Motor Speedway on Sunday, May 27 for the Coke 600.